In a world where digital rule almost everything, where the dynamic of the internet has become the evolution for businesses. Allowing everyone to begin the start-up journey with the ease-of-use internet channels. 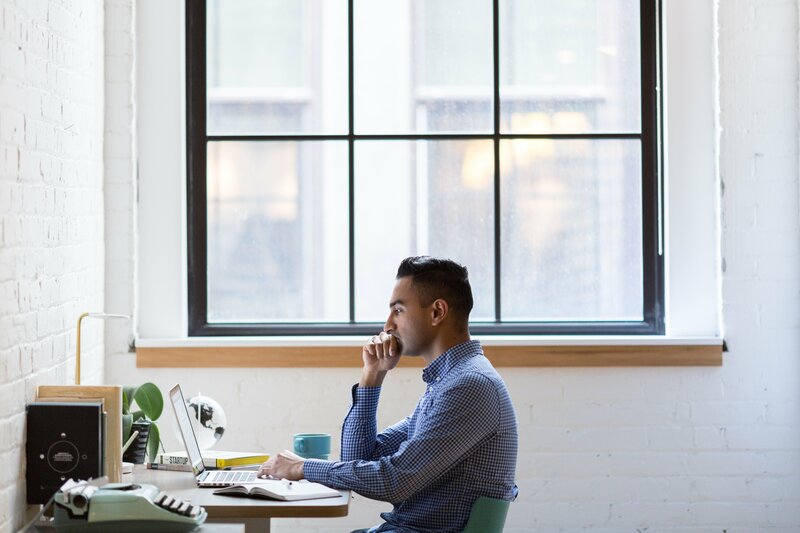 But it was never easy to start a business alone, and it’s even harder to grow the business itself, especially when traffics to your own website plays such an enormous role to gain awareness and sales. Yes, to get traffic to your own website is sometimes a pain in the arse. Some might need to acquire skills to write up punchy descriptions or articles to increase their SEO ranking, some will need to spend thousands of dollars to boost up their ads or campaigns. And there are those who would just hire somebody to do it for them. You are right, getting people to promote your products or your brand can, in turn, bring more traffics to your website. And in most cases, they are one of the ways to increase the conversion of your business. To break it down into simpler terms (as we always did). Affiliate marketing is a joint marketing effort between the merchant and the affiliates which consist of mutual benefits between each other. An affiliate will earn commissions whenever there are an increase of visitors or conversion to the merchant's website through his/her effort by using the affiliate links. There are times when you scroll through your social media, especially Instagram, you often came across some popular (Influencers) talks about a product or brand. These posts come with a link to a website, and these are all affiliate links. In returns, the affiliates will get a kickback and earn part of the sales. Online businesses, especially small businesses, will need to create awareness for their products to sell and create a well-known brand. 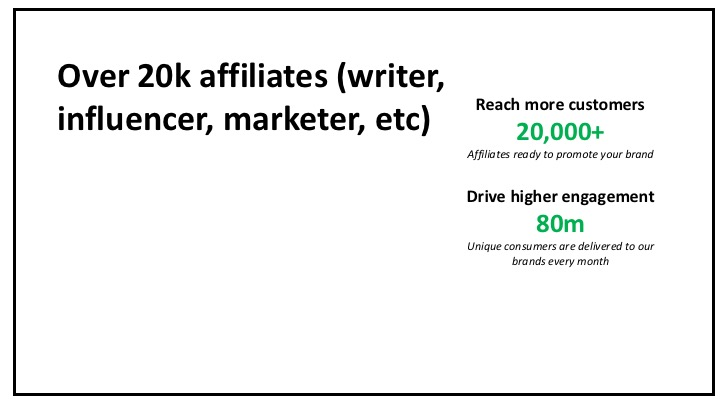 Therefore, getting on an affiliates platform to help with the process is actually one of the best ways to do it. 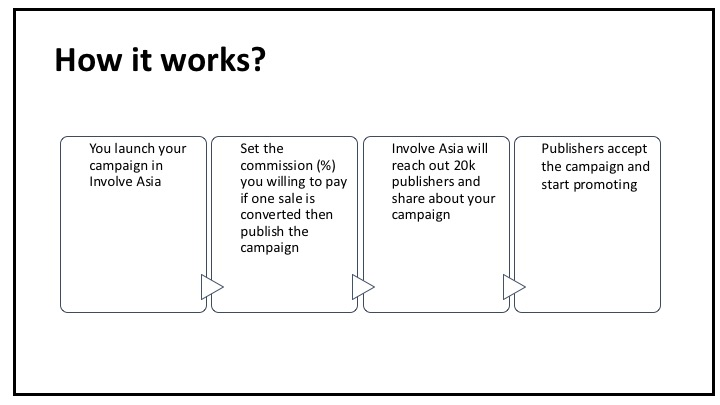 Involve Asia is an affiliate marketing platform that helps connect advertisers (sellers) to publishers(affiliates) through native advertising solutions. 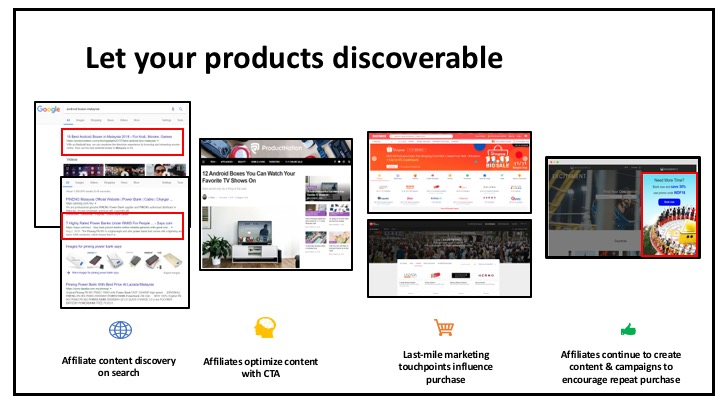 The affiliate program with Involve allows you to run unique sales campaigns with world-class publishers to get your brand/products in front of millions of engaged audiences. Present positive reviews and recommendation through content, social, and promotion. Create conversion, drive last-mile marketing through evaluation touchpoints, and attribute each sale to successful partners. Strengthen retention, drive loyalty and repeat purchase from existing customers. With over 20k of potential affiliates to, you don’t even have to worry about finding affiliates to help you promote. 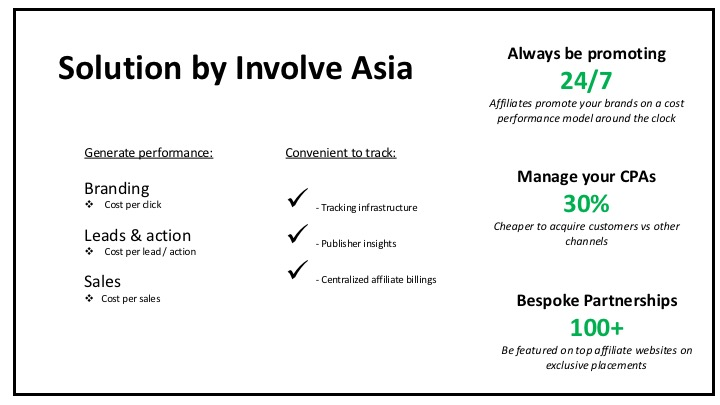 Plus, you can generate performance and it is more convenient to track your affiliate programs with Involve. Besides, the steps of launching your own affiliate programs are easy too. Just a simple workaround with the platform can get your into the right direction of getting your next sales! Their major publishers are from Malaysia, Singapore, Thailand. This will benefit you if your target market is one of these three. So what are you waiting for? It’s time to get your website visible to more audiences! If you're interested, fill up this form to get your brand to be promoted and Involve team will contact you in 3-5 working days.